A road trip along the best drive in North America, a ride up a 2 sectioned gondola, and a chair lift to the peak will take you to the top of Whistler Mountain where you will find an unadulterated view of one of the most stunning mountain vistas in the world. With no other towns or villages to see one is faced with black tusk mountain in one direction and a host of glacier peaks in the other. 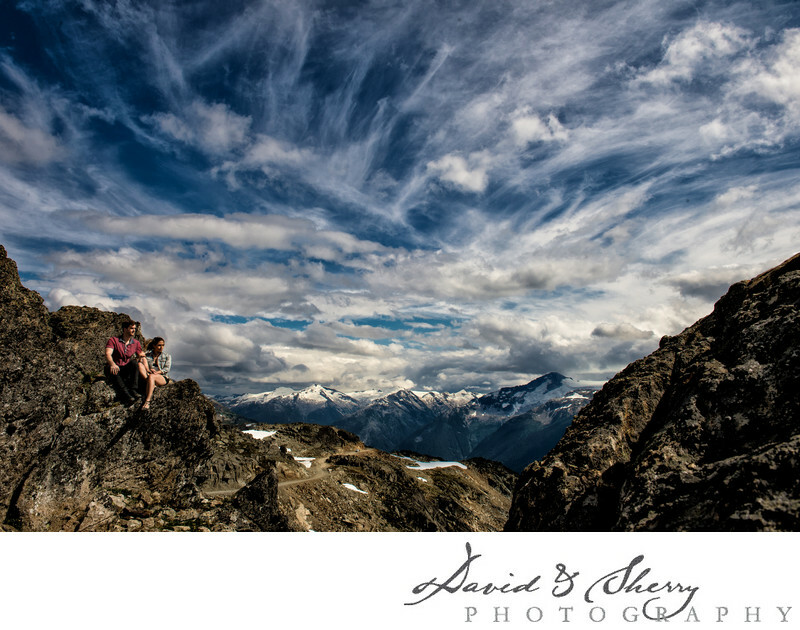 Wedding photos at the peak and pre-wedding and engagement pictures may take a bit of effort to get to, but you will be rewarded with an Epic Couplescape portrait to showcase at your wedding or with your family in one of the most stunning views in the world as your background. David & Sherry photography specializes in capturing landscape photos with couples, individuals and families in their pictures to create a piece of art that is truly unique to the couple or individual. One of the many places to take pictures in Whistler other than the peak of the Whistler and Blackcomb is to head into the back country for a hike. You are always bound to find a beautiful view, lake, river or waterfall to incorporate into your photographs.